Kazakhstan’s ambitious project to establish a financial services centre in Astana is now real, as the country launched July 5 the Astana International Financial Centre (AIFC), The Astana Times reported. The new financial centre, in a new part of Astana where the city hosted EXPO 2017, is set to offer financial services, including in financial technologies, Islamic finance, green finance, capital market and asset management. The centre has a management council, a financial services regulator, AIFC exchange, an independent financial court involving nine judges from the U.K. and the U.S., and an arbitration centre, among other bodies. Kazakh officials expect the centre to attract $40 billion of investments by 2025. The AIFC is the brainchild of Kazakh President Nursultan Nazarbayev who voiced the idea to set up the centre in 2015 with benefits offered to companies, an independent court and English common law principles incorporated in the work of the centre. “The AIFC is a new chapter of independent Kazakhstan. Its launch is an important step in the steady and sustainable development of Kazakhstan,” Nazarbayev told a grandiose ceremony July 5 also attended by Abu Dhabi Crown Sheikh Prince Mohammed bin Zayed bin Sultan Al-Nahyan, Islamic Development Bank Chair Bandar Hajjar and JP Morgan Chase International Chair Jacob Frenkel. Kazakhstan recognised the need for long-term, sustainable institutions, he said. “We thoroughly studied the global experience in establishment, development and work of financial centres across the world including in Singapore, Dubai, Hong Kong and other countries. 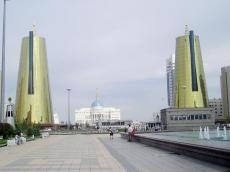 The Kazakh model of the AIFC incorporated best practices of these structures,” said Nazarbayev. “Astana should become the main financial hub of the region and in the long-term perspective should be among leading Asian financial centres,” said the Kazakh President. The centre enjoys a special legal regime envisioned by constitutional law and offers incentives to companies, including exemption from corporate income tax and personal income tax for 50 years, a visa-free regime for citizens of 48 countries and a simplified employment regime. Fifty companies have registered at the AIFC so far.